I looked out the window. It was dark. Really dark. 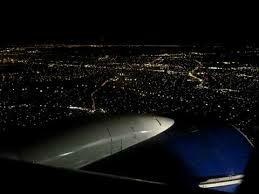 I could see tiny lights on the ground that marked the outer band of development of this sprawling city. But mostly, I could see nothing. Endless visibility? Hardly. Darkness and visibility don’t go together. Or do they? The practice of contemplative prayer invites us to quiet our minds, set our egos aside for a moment, and lean back (as Tilden Edwards says) into our spiritual hearts. But when we do – when we actually release the images and ideas and random thoughts that pop into our minds, what’s left is darkness. Just me and my emptiness. And that doesn’t feel great. The darkness we meet on the inside is far scarier than much of the darkness we face in our everyday lives. I long for the light of my thoughts, the brightness of my carefully constructed ego with all of its success and pride and satisfaction in what I’ve built around me. I grasp for ideas and solutions that flow through my mind, eager to climb back out of the abyss. And yet when I’m able, for whatever reason, to let go, to release what I’m clinging to, to fall into that darkness within, I discover something incredible. That the visibility IS endless. In the darkness, I can see Love. In the darkness, I can see Peace. In the darkness, I can see New Life. I’m grateful for the gift of the darkness. I’m grateful for the courage to let go and let the darkness close around me. Because when I release all I have collected to make me feel safe and loved and powerful, I discover true security, true love, true power in the arms of the Divine Creator and Lover of us all. Thanks be to God for the discovery of abundant life in the darkness.